Charlotte is an fo!! This shawl is so addictive because of the color changes. I love Koigu. We had to take my younger sil to Ft Wayne for a retreat so we decided to kill two birds and take the kids to the Ft. Wayne children's museum. It is one of the best in the country. It is also less than five miles from Cass Street Depot one of my favorite Indiana yarn shops. They have a nice selection of Koigu so I got some in berries with a hint of brown and light blue. Very yummy. 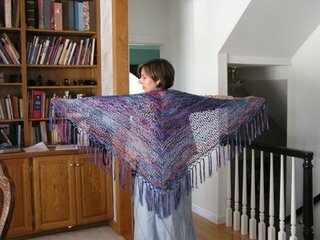 I swatched for a cardi but I have to finish the obligation shawl(sil wedding before I start anything new). Oh Elizabeth, it's beautiful!! You always make me want to start something new. Your artistic talent shines with fabulous light, and we all want to bask in your glow. Wowie! That is really stunning! Very lovely. The colors in your Charlotte blend beautifully. And, a Koigu cardi; sounds wonderful!